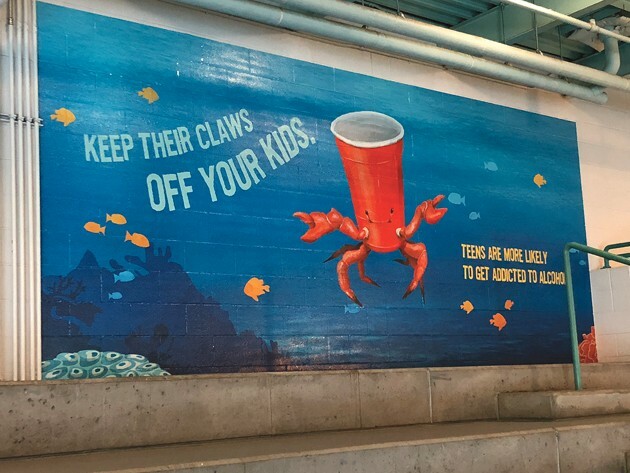 Tooele City’s Pratt Aquatic Center now features larger-than-life, custom illustrated murals on its walls and windows to remind parents and students about the dangers of underage drinking. 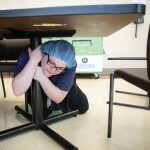 Tooele City and Valley Behavioral Health received a $20,000 grant through Parents Empowered, a media and education campaign funded by the Utah Legislature, to help spread the message in the Tooele area for the next two years, said Stacy Smart, director of Tooele’s Communities that Care program. “We decided for the first year, we would kick off the campaign at the pool because that’s where several parents and their children get together,” Smart said. Parents Empowered provides parents and guardians with information about the harmful effects of alcohol on the developing teen brain, along with proven skills for preventing underage alcohol use. 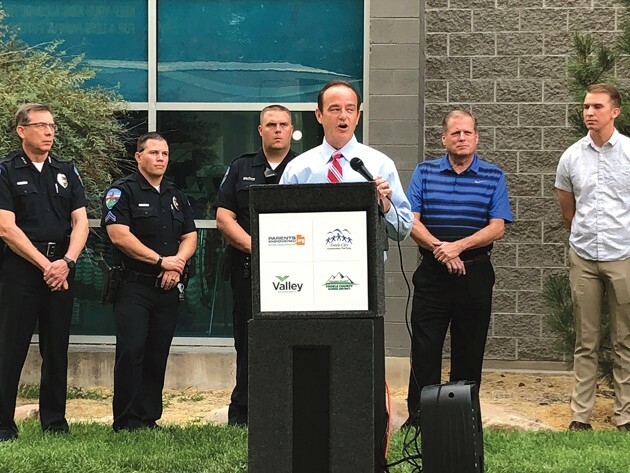 Representatives from Tooele County School District, Tooele City, Tooele City Police Department and Valley Behavioral Health helped to unveil the new murals at the aquatic center on Aug. 11. About 150 people attended the event. Speakers at the kickoff included Peter Clegg of Valley Behavioral Health; Brad Pratt, Tooele City Councilman; Tooele Police Chief Ron Kirby; Scott Rogers, superintendent of Tooele County School District; student Courtney VanDerwerken from the Resist Alcohol & Drugs and Prevention Advocacy coalitions; and Ashley Bishop, Guiding Good Choices facilitator. 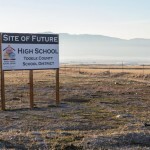 Pratt said the campaign will include additional signage posted around Tooele to remind parents to talk with their kids and set clear rules about no underage drinking. Rogers said new research shows just how harmful alcohol is to the developing teen brain, potentially impacting memory, learning and decision-making abilities. Parents were reminded at the event that simple moments, like spending time at the pool together, helps strengthen their bond with their children and that studies show kids who feel close to their parents are much less likely to drink while underage. “We are absolutely committed to caring for the youth in our community and are very proud of the county-wide effort — especially by Tooele’s parents — to keep our kids healthy and safe,” said Tooele City Mayor Debbie Winn in a news release. “We understand the life-long implications alcohol can have on a developing teen, and we aim to ensure all teens grow up free from the potential harms caused by underage drinking,” she said. 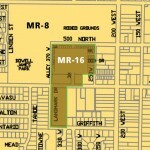 Pratt added that the city’s administration and city council are equally committed to protecting Tooele’s youth from the harms of alcohol consumption. “Our local coalition, Tooele City Communities that Care, has had an ongoing partnership with Parents Empowered to eliminate underage drinking,” Pratt said.